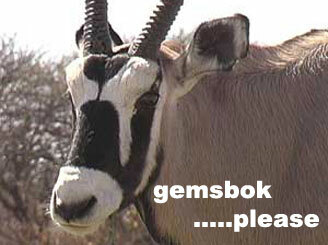 In my mind, no other animal quite signifies Africa as fully as the gemsbok. Their beauty, incredible markings and elongated dagger like horns spell AFRICA in capitol letters. Therefore, this majestic antelope held the number one position on my first South African safari wish list. The remainder of the roll read, number two…blesbok, number three…kudu, number four…impala, number five…warthog and number six…blue wildebeest. If I could be so lucky! 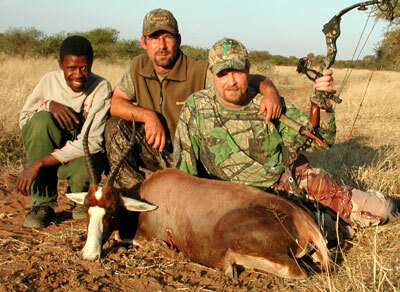 After months of research, pouring over anything that could be found pertaining to hunting South African plains game with bow and arrow, I very confidently chose a safari company. Dries Visser Safaris, booked through Stick and String Outfitters of Pine Colorado, would host my nine day adventure. 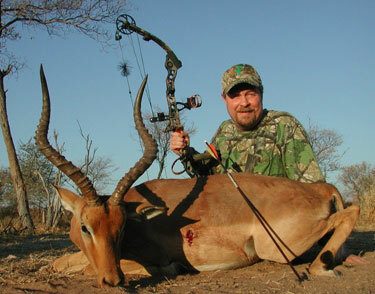 Dries Visser Safaris has specialized in bow hunting for the last 12 years, in which time it has risen to be one of the top safari companies in all of South Africa. Citadel, the main hunting area encompasses 20,000 acres and is exclusively reserved for bow hunting. With a variety of game that includes at least 27 different species, it looked to be a bow hunter’s paradise. The key strategy would be to hunt water holes from carefully placed permanent blinds, with the average shot being 15-20 yards. It sounded perfect. It was October 2005 and with our booking for the middle of July 2006, we had nine months to ready ourselves and our gear. By we, I mean that my son in law Al would be taking the trip also. Al is a professional videographer and to have my safari on video would be priceless. I’m going to skip right over the travel from Seattle to the Visser ranch, except to say “it was looooonnnnnggggg”, and get right to day one in the blind. Matt Burrows of Stick and String Outfitters and I would be sharing a Professional Hunter (PH) during the hunt, so on the first morning Al and I would be dropped off at a blind by ourselves. Hein Lottering, the PH would sit with Matt in the A.M. and pick us up between two and three in the afternoon to switch blinds. That morning we had a virtual parade of game come to water, animals we’d only seen in magazines, books and of course, on the internet. 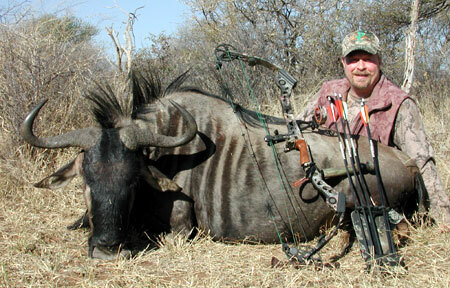 Waterbuck, including two bulls in the 27 to 28 inch class, spent nearly three hours within bow range. Several red hartebeest, both bulls and cows came to water. A group of five impala ewes drank for several minutes before drifting back into the bush. One lonely warthog came in to quench his thirst and everywhere we looked there were little gray Vervet monkeys. Although on my list, Mr. Warthog had some growing up to do as his tusks would measure only about five or six inches in length. No other animal on my wish list made an appearance and no shots were taken except with the cameras. Just before 3:00 Hein called to say he was on his way in and I gave him the OK. Al and I both heard the truck coming but only after several waterbuck rapidly vacated the waterhole leaving a heavy cloud of dust in their wake. The three of us must have telepathically willed the bull to turn broadside and when he did my arrow hit its mark. Anxiously, we viewed the video and the shot looked good. About ten minutes after the shot Hein spotted the bull still on its feet but looking very sick. It would be dark soon as the big orange African sun was falling fast and rather than taking to the trail right away Hein thought it best to let the huge bull be, go back to camp, eat dinner and come back in a couple hours. We would return with extra help in the form of Jock the wonder Jack Russell tracking dog and a couple of the Visser staff professional trackers. After a wonderful meal of kudu this and kudu that with kudu dessert we were back out looking for kudu. My bull had gone down within 300 yards of the blind and took only minutes to locate. Nothing could have prepared me for this experience. Walking up to this regal animal brought tears to my eyes. I could not believe what a truly magnificent first African trophy I had taken. With fabulous, long, wide spreading horns, ivory tips and a below the neck mane that is 10 to 12 inches in length, it will occupy center stage on the Africa wall in my trophy room. And, it’s all on film. After a good night sleep in our plush accommodations we were awakened to the early morning howls of cruising jackal just outside camp. Talk about eerie! What would day two bring? After six hours in the blind with only a couple waterbuck spotted, we were all smiles when a bachelor herd of seven blue wildebeest bulls emerged from the bush. They were on a beeline to our location and at nearly 300 yards Hein had already picked out the largest, a great bull with long horns sweeping out past his ears before making their upward turn. Finally, at 18 yards and slightly quartering away the awesome striped bull presented the perfect shot. The track was easy to follow. I now had two of my desired species in as many days. At the conclusion of day two not a single gemsbok had been seen. Sitting alone, Al would be filming another hunter today, for a full day in the African bush country is an awesome thing to do. Reading, thinking, eating and of course watching the continuous wildlife show presenting itself just 16 yards away made the hours zip along at light speed. No shots were taken this day, but I would not have changed a thing. About midday two of Africa’s most unique plains game, the nyala and the tsessebe, showed themselves. Grand bulls of each species spent several minutes getting their fill of the cooling and much needed water. At the close of day three, still no gemsbok had been seen. Hein and Matt would spend the morning of day four sitting the same blind I had been on the day before. Nyala was high on Matt’s wish list and after seeing the video I’d shot of the big bull with Hein’s camera, they were both chomping at the bit to have a crack at him. The sun was directly overhead when Hein’s voice came over the radio. He was on his way to our blind and I gave him the all clear. Within minutes we were loaded and on our way to a different part of the 20,000 acre ranch. Gemsbok had been spotted and we were wasting no time getting there. Let me say that at the end of the day I had still not seen a gemsbok but I did have a gorgeous impala with deep “S” shaped horns that tipped out at the tops and had lots of mass. He had come in to water and for the first couple minutes he was facing dead away. Then, as if on cue, he turned slightly. I looked at Hein, Hein looked at me and we both nodded our heads. The 18 yard shot passed though the ram so cleanly he ran a short distance, stopped, looked around in bewilderment, took three more steps and fell to the ground. He traveled just 22 yards. Unfortunately, the big nyala bull had not returned for Matt. Day five was a repeat of day three except Al was back. We spent the day at the same blind I had sat on day three and as luck would have it, the big nyala bull was back also. In fact, he came in twice. The second time he brought along one of his buddies. A great bull but not nearly the caliber of Mr. Big. I was learning these African animals are as fickle as any North American species. Oh, and by the way, you can probably guess, no gemsbok were seen. Long before daybreak of the sixth morning Hein and I were perched above the ground in a treestand. Hopes were high because this was an area that gemsbok frequent. Treestand hunting is new to me and even though I was secured with a safety strap, when the wind started blowing I started hanging on to whatever branches were available and Hein said it was time to get down. Thank you Hein! Back at camp, Al was waiting and after a quick lunch we loaded his gear into the Toyota and were on the road. From our afternoon blind we encountered five different species of plains game and gemsbok was not one of them. We had two eland bulls and one cow come in, one super wildebeest bull, five impala rams, two of which were shooters, one of which had black facial markings, two sow and three piglet warthogs and finally, one steenbok ewe. It was the black faced impala’s lucky day. Had I not been holding out for the illusive gemsbok and had I not already shot a fabulous impala he would have been hurtin’ for certain. No shots were taken this day. The spell was finally broken! I actually saw my first gemsbok on morning number seven and it was a good bull to boot. Hein and I were back in a treestand again and sadly, like the day before the wind was blowing. The striking black, white and gray bull must have winded us because at 80 yards he abruptly changed direction and was last seen disappearing into the thick bush at about 200 yards. Darn! 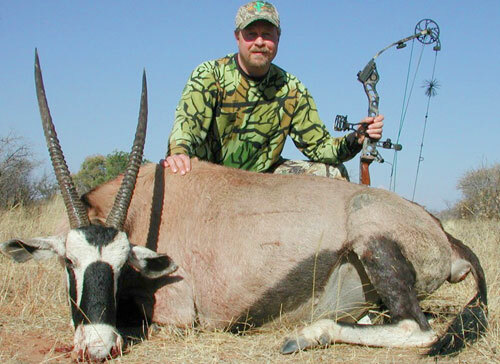 We did have a group of blesbok approach but 43 yards was the closest they came. We secretly watched them until the scene was clear then climbed out of the tree. As we drove in to our afternoon blind site, my heart sank for there was a herd of gemsbok already at the water. Hein assured me that this was absolutely perfect. It was only 11:00 and he was certain they would return before days end. Al and I climbed into the blind, lit a line of zebra dung as a cover scent and settled in while Hein and Matt continued on the quest for a nyala bull. The burning of dried dung, zebra being the best, is a very effective method of covering human odor when hunting from blinds at close range waterholes. One and a half hours later through the deep tangles of bush we picked up movement. The herd was working its way back in! One hour, almost to the minute, after that we had eight of the most outstanding specimens of African game to ever walk the earth at between 17 and 21 yards. Moments like this happen rarely in one’s life and I was enjoying it to the max. At 21 yards the single bull of the bunch stepped clear and I released what felt and looked like a flawless shot. Video confirmed the shot had been perfect. Seven days worth of gemsbok adrenaline was now coursing through my body and I began to shake. It was hard to control myself as I radioed the tracker. My number one African species had covered just 132 yards before expiring. Each of the seven cows was much longer in the horn than my bull, some looked to be a foot longer, but my mind was made up, I wanted a bull and now he was mine, all mine. It had taken a full week to collect my number one and believe me; the wait was worth every minute. With blesbok and warthog being my only remaining species, hunter and cameraman would spend day eight sitting Hein’s favorite blesbok blind. It was now mid afternoon and I was watching several kudu, waterbuck, impala, hartebeest and wildebeest all milling around just a few yards away when Al said there were more animals coming in from the other direction. When I looked over, what I saw were blesbok, lots of blesbok. What a sight to behold, nearly 50 of these beauties were on a march to our waterhole. Although both rams and ewes can be taken, one good ram stood out and he was my primary target. As each animal got its fill of water it would begin migrating off in the direction from which it had come. The ram closed to 14 yards and each time I came to full draw another animal would step either in front of or directly behind him. His thirst was satisfied and with no shot opportunity presented he was moving off. With less than a dozen animals remaining I told Al to focus on the outsized ewe coming in to drink on the left side. If she gave me a shot I would take it. Seconds later I was ready to release my arrow. At the shot, she was off. As with any hunting, shot placement is critical and this shot could have been better. My arrow took her about three inches back of my intended mark and I was genuinely concerned. If not for the knowledge and expertise of Hein, the staff trackers and the Jack Russells this beautiful animal may not have been found. After two hours of intense tracking she was located. With enough strength to stand and move off no bow shot was offered so Hein honored my wish and promptly took her with his ’06. These African animals are down right tough! I had five of my six species. 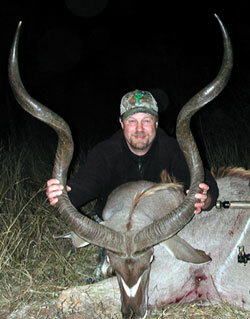 Again, collection of this trophy is a testament to the professional operation of Dries Visser Safaris. The sound coming from the alarm clock signified the last full day of this amazing adventure. Al would spend the day at Pilanesberg Park filming as many of the Big Five as he could, so I would be sitting alone again today. If a good warthog boar came into bow range I would do my best to close the deal. As the sun began to drop from the sky after a long day I picked up my bow and peered through the sight. My hunt was over. Although I did not collect a warthog, my day was as good as they get. Among the myriad of game that graced me with their presence this day were eight Cape Buffalo bulls. Talk about huge; the size of these mountains of meanness was astonishing. For the hour and a half they occupied the waterhole not another animal came to drink. What a day and what a fitting end to my first African safari. 2008 can not come soon enough. I will be back for a warthog and add a couple other species that now occupy my African daydreams. Dries Visser Safaris is the only safari company I have ever used and I see absolutely no reason to change. When filling out their hunter survey before departing for home, it was very easy to write 5 stars in all categories. Thanks go out to Hein, the entire Dries Visser staff, Stick and String Outfitters and to my son in law Al for making this adventure one that is permanently imprinted in my mind.